My first trip to the Boleyn in 2014, came after we had dragged ourselves out of the bottom three, via a win at fellow strugglers Cardiff. Also we had conspired in 2 back to back games to have no cup involvement for this year. With Collins back, and Carroll on the mend, believe it or not I actually fancied us to get 3 points at home against a Newcastle team , who have been a bit up or down themselves. The biggest blow was the loss of Tomkins, due to getting a silly red last week. Him and Collins (until Reid comes back), are as about as good as it gets at the back for WHU. Anyway, another defensive shuffle brought Matt Taylor in as right back. Now, using a left midfielder as a right back tells you everything Sam thinks about our current table topping youth policy ! As much as he puts a shift in , Matt Taylor was getting the run around in an unfair position, and that starts to stretch the defence, which didn’t help with Newcastle going 2-0 up with goals from Cabaye and Remy, and really looking to run away with it. However some persistence from Carlton Cole, got a (own) goal back just before half time and there was a small chink of light opening up for West Ham. Morrison started the second half, which was a encouraging sign from Sam, that he thought it was on, and after 15 mins Carroll joined in on the pitch, in favour of the increasingly disappointing Diame. With a real two up top and some real supply with both Downing and Jarvis still on the pitch, WHU started to pressure the magpies, and both Carlton Cole and Andy Carroll missed sitters to equalise and possibly go on the register back to back wins. And then Sam decided all the attacking was a bit too exciting , so he brought Joe Cole on for Jarvis. Now, like most WHU fans , i have always been a JC fan, but this time around the experiment has failed and needs curtailing as soon as possible. He really offers nothing extra to what we already have for less wages, and therefore we need to replace him with something more suitable. Anyway, WHU go on to stay 2-1 down until Cabaye put a lovely free kick in at the end of the game to seal the win for Newcastle. So while I’ve cut JC off from the WHU gravy train, lets look at a couple of others in that midfield. Diame and Morrison. Both are similar , in as much they are game winners both on their day, but they really are not interested at WHU. TO my mind lookd like Diame wants out and Morrison is being played out of position. So if Diame want to go, lets move him on. Because if he is refusing to utilise his talent, all the cajoling in the world, from the current management team, will make no difference. Morrison is different. We keep hearing about how good he is, but apart from small flashes never see it. Now we have some established players up top, it makes sense to put him in the no 10 role. But with one up top , Sam will want to ever erratic Nolan there. Thererfore we have an issue. We can leave Morrison in the midfield but sitting along the line and waste him or we move him on as well, and see him become an international rated midfielder. 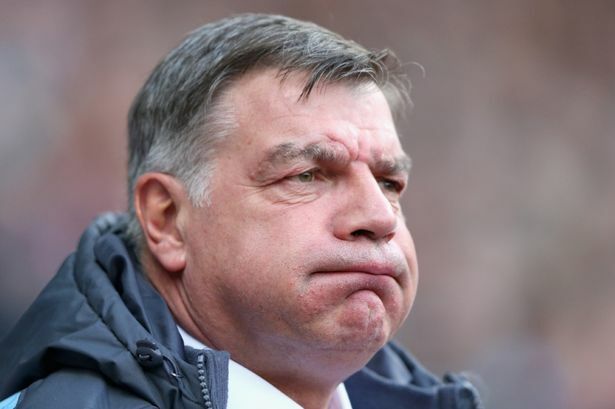 Interesting times for Sam, and he will need all his management skills to balance the team and get the points. If we right off the next game, away to Chelsea, February becomes massive for WHU, we have Swansea, Villa, Norwich and Southampton, with 3 of those at home . Take 10 points there and stay up, take 1 and get relegated, it really is that easy. Hopefully th Lescott deal will be complete in Jan as well to shore up out leaky defence. Back to the game. Noble, and Collins played well, and when they were both on the park, Cole and Carroll looked a formidable partnership. But for his 2 goals i’ll give Cabaye the MOTM. Sam, now is the time for you to do your job, and sort this mess out, or maybe we will move yo on in the January window as well. Deal or no Deal, Sam ? Its time to go to work. WHU have replaced their wingers Vaz Te and Jarvis with Nolan (!) and Joe Cole. 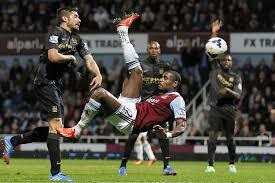 Pogatetz came in at the back ultimately replacing Demel. No surprises that Carroll keeps his place up top. But this looks more of a 4-3-3 formation rather than a 4-5-1. Gabby Agbonlahor is not in the starting line up for the Villains, so not good for them. Villa came out all guns blazing and had Wienmann had an open goal chance put wide after 2 minutes following a shoddy rebound by Jussi. Villa , one of the worst teams at home this season , have the best of the early exchanges, against the team that have the worst away record in all the English professional leagues. West Ham took some big bangs in the first half hour with a saving tackle from Joey O’Brien ending in another early finish for JOB and Guy Demel coming on in his place. The impressive Tomkins also got a kick in the face from Delph. It was very accidental, and more of a result of putting his body on the line. Aside a few half chances, the first half came to an end at 0-0, which was fair. I would say WHU moved the ball around better, but Villa were more direct in the attack. 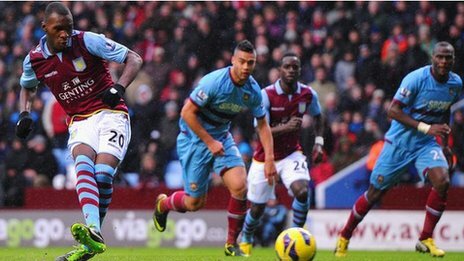 In what has become Villa’s trademark this season, WHU started the second half way on top. But the Villa defence held on, and the WHU attack didn’t make the pressure tell by way of shots, which is a tad worrying. Corner after corner with nothing to show is not good form Sam ! By the way, your 4-4-2, looks worrying like 4-5-1. Just after the hour mark, on comes the former WHU transfer target Darren Bent. Bit of a worry for me, if im honest. And after being on for at least 2 minutes, he clears an Andy Carroll goal off the line following a corner from Taylor ! Then RVT comes on for Taylor. Nathan Baker picked up a silly card just before 70 mins, for taking out JC who was rampaging down the right,. The resulting free kick from JC was put over by Nolan. Villa sent straight up the other end, and N’zogbia was fouled by Noble and Villa get a penalty. Benteke took the pen very cooly into the bottom right. One nil Villa. Sam makes an unusual change by putting on CC for Noble ! CC had a chance almost immediately, but got it caught in his feet. 2 mins later, N’zogbia pops a great free kick into the top corner, to make it 2 and over as a game. WHU throw everything at Villa in the last 10. And it pays off when a mistake in the Villa defence leads to an own goal from Westwood. Despite all this Villa hang on for a win. Not deserved, but a win anyway. A draw would of been a more fair result. So where does this leave WHU. Nowhere as usual. Sam needs to move on at the end of the season. I think the board have this in mind with him having no contract. Nolan could go with him as well at this stage. Nolan especially pisses me off as he has the skill to play, just decides not to bother. I imagine we also lose Carroll if BFS disappears at the end of the season. Tomkins played well today, and hopefully has graduated back into the first team, or he will be off at the end of the season. Diame seems to be getting back to normal. CC looked lively when he came on. MOTM for me should be Tomkins, but leaking 2 goals means he is out. I’ll give it N’Zogbia for his free kick and winning the penalty, and his constant attacking down the right flank. Benteke casually puts away the penalty for the first goal.